Our author would like to be a better cook – and would love to serve her guests Michelin-level dishes. What would be more appropriate than learning from the best? I like cooking. And I also think that I’m quite good at it. At any rate, that is what the friends and colleagues who I invite to dinner at my house once every two to three weeks say. I think that I am, first and foremost, well-organised. When my guests arrive, the food is virtually ready – and I can focus on the wine, the conversation and all of the other requirements of my guests, as the hostess. I have a repertoire of eight to ten dishes that are easy to prepare yet look impressive. Veal loin from the oven, trout tartare, fish soup. The problem is just: my friends are starting to know my repertoire by heart – it is becoming difficult to continue to wow them with my cooking. Unfortunately, however, that is my intention. So I am looking for new dishes which I can use to create a fantastic menu. Dishes which are easy to reproduce at home and, at the same time, exceed all expectations. What would be more appropriate than learning from the best? Alfons Schuhbeck is the king of the Platzl. 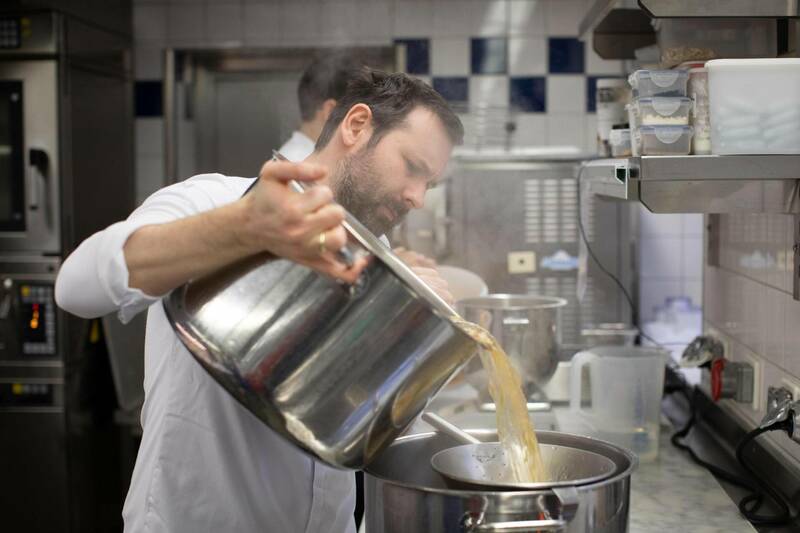 Here, in the heart of Munich’s city centre, he runs three restaurants, a cookery school, an ice cream store, a cereal store, a tea shop and a spice store. When he is not sitting with Markus Lanz, you will often see him sprinting across the Platzl in a white chef’s jacket – on the way to his office or to the kitchen. Schuhbeck is inseparably associated with Munich; his face can be seen virtually everywhere. 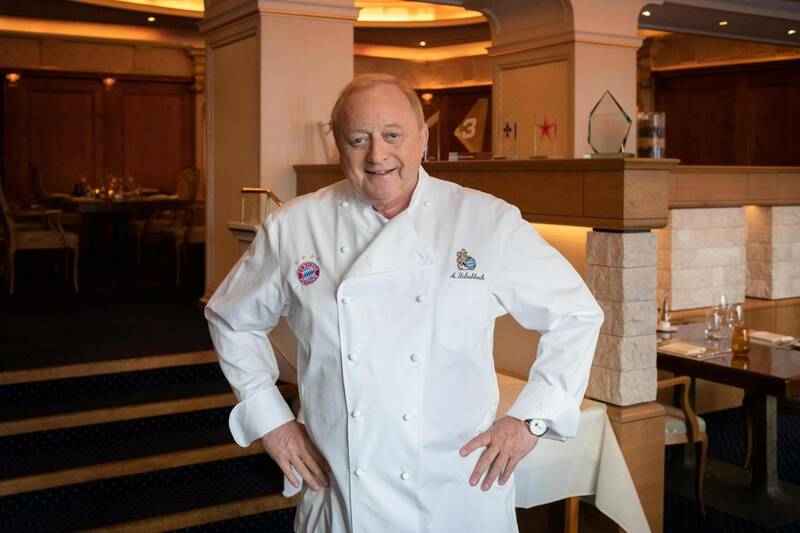 He is the personal chef of FC Bayern, and he is known far beyond the borders of the city with his Bavarian cookery books and the dishes that often have roots in the region. Maurice Kriegs peels the skin off the char fillet, places it on a plate and puts it to the side. Why does he not throw the skin away? 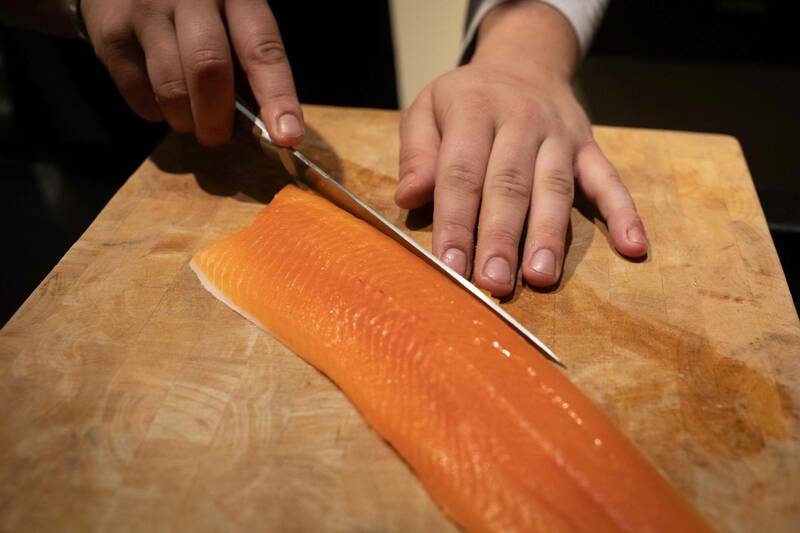 “We will make it into crisps later in the kitchen,” he says and explains how the fish skin can be placed on baking paper and dried in the oven. I am fascinated and can just imagine how something as unusual as fish skin crisps would impress my guests. Maurice puts the char fillet on a plate and wraps cling film over it. “Doesn’t that melt in the oven?”, I ask. Maurice explains that cling film can tolerate heat of up to 90 degrees. “The aromas combine under the film; it acts like a little oven in the oven,” he says. That was also new to me. However, it sounds not only logical, but also like a valuable cookery tip. 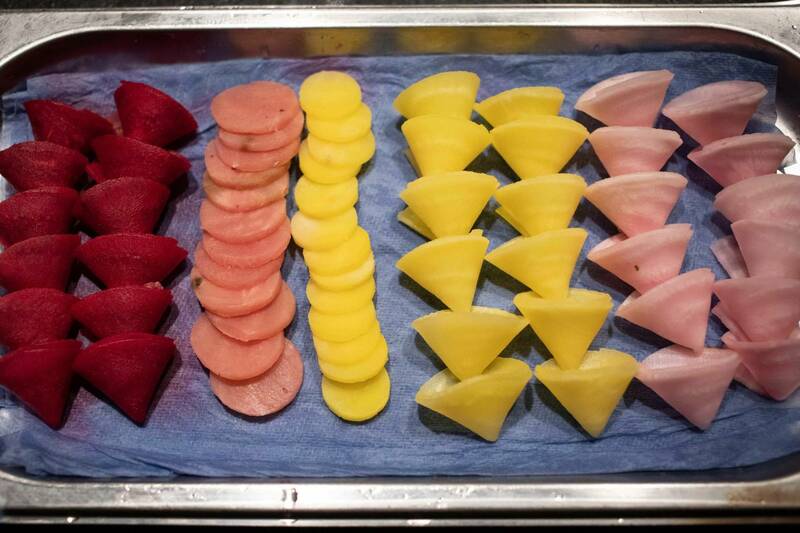 More difficult than the preparation of the char are the various sauces which sit in spring colours behind the plate. “But all of the sauces and purées can be prepared in advance,” says Maurice. “When the guests come, you just have to put the char in the oven.” Finally, some brown butter and finely chopped chives go on the fish. The char actually melts in the mouth to the extent that tears almost come to my eyes. The combination of sauces and purées also goes wonderfully well with the fish. I must admit, the serving (with tongs!) takes a little time and patience, but if necessary – according to Maurice – this can also largely be done before the arrival of the guests. “And when you have reproduced it all once, you will have got the hang of it.” When the plate is ready, Alfons Schuhbeck joins us. “Yes, that will do!” he says and looks at the plate, which represents a really wonderful start to the meal in all its colourful splendour. Christian Jürgens is one of the best chefs in the world. 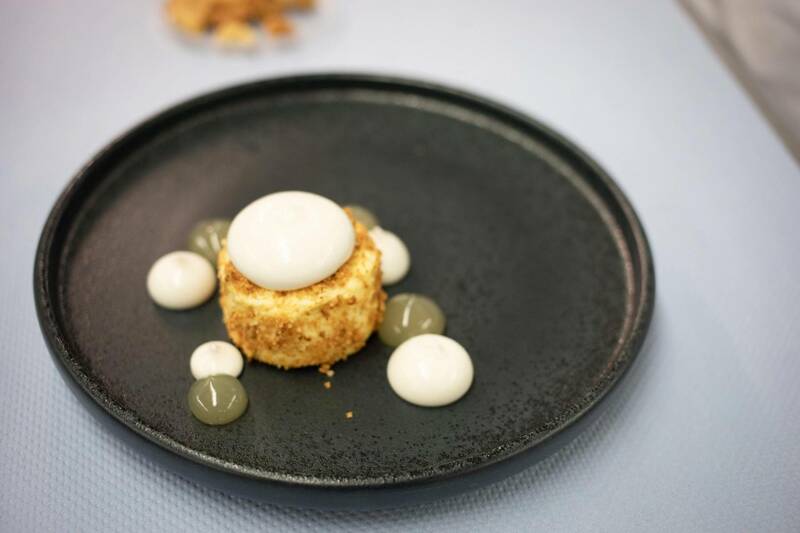 In 2013, he was awarded his third Michelin star in the Überfahrt on the Tegernsee and his cooking has remained at the highest level since then. I was anxious about this appointment. 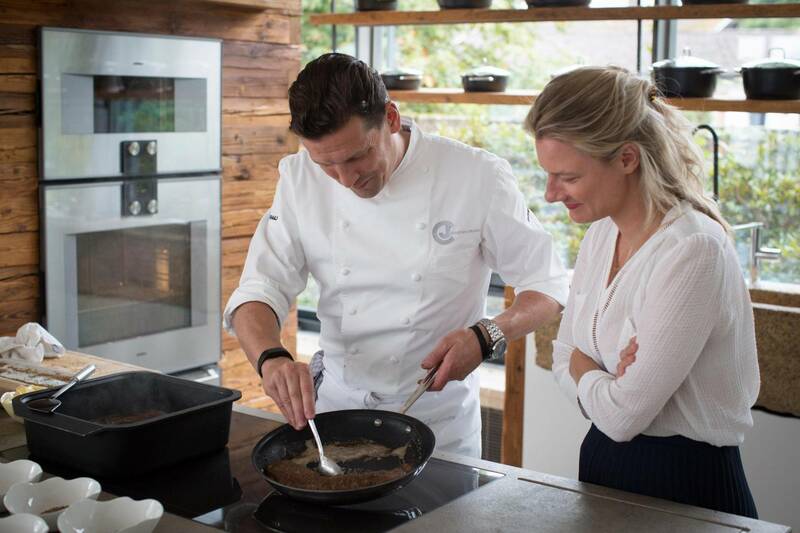 Cooking with Christian Jürgens seems like a minor act of sacrilege. Like asking Jil Sander to patch up the hole in my jeans. During the preliminary discussions, Christian Jürgens was so friendly in his replies to my e-mails that my anxiety disappeared. 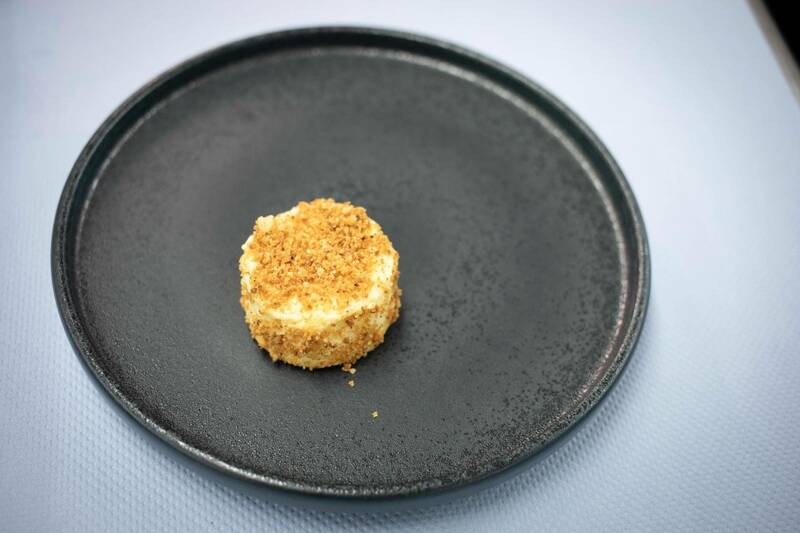 Five years ago, I ate food cooked by Christian Jürgens, privately, and I can still recite the menu in my sleep – that is how much it surpassed everything that I had eaten before. We meet Jürgens and his restaurant manager Peter Nasser in the cookery school next to the Überfahrt restaurant. He too stays regional for his main course: it is saddle of venison. 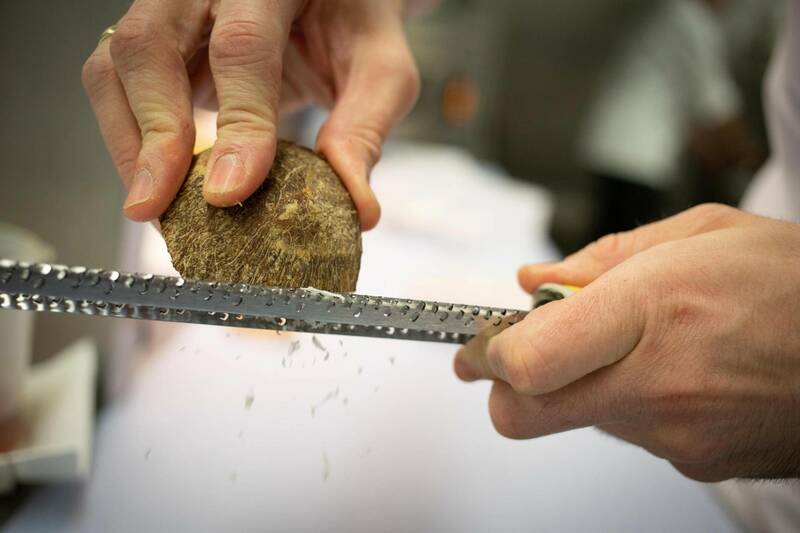 The cookery school is furnished in a modern yet aesthetic manner down to the smallest detail: a lot of wood and natural stone alongside high-end kitchen equipment. The saddle of venison lies next to the oven. Beside it are all the seasonings that we need for the marinade. Cooking with Christian Jürgens seems like a minor act of sacrilege. Like asking Jil Sander to patch up the hole in my jeans. Jürgens, wide awake, focussed, strict, but friendly, wants to get started straightaway. His hand movements are precise. The mixture of seasonings is crushed. Jürgens explains how important a good mortar is for this work. 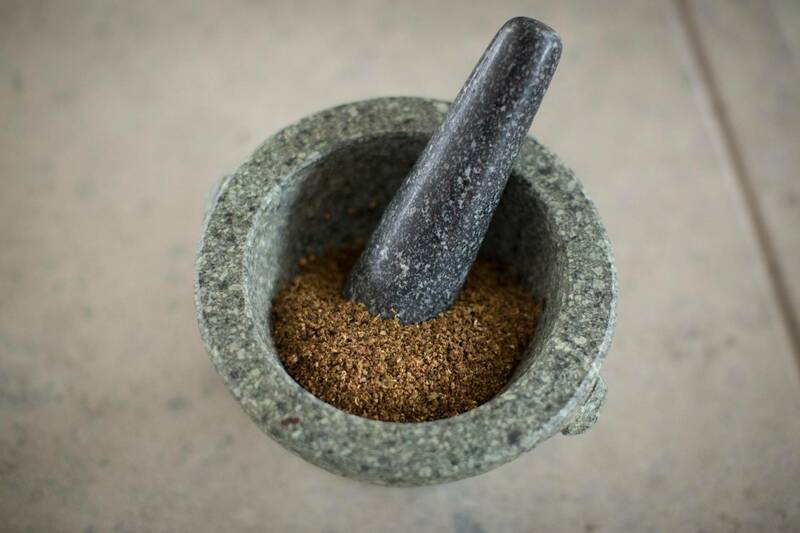 It is not that easy to crush the seasonings so fine that they can be rubbed in to the saddle of venison. Then Jürgens browns the venison bone for the sauce and adds vegetables and bacon; a pleasant smell immediately spreads through the cookery school. It smells like my late grandmother’s kitchen, warm and cosy. From Christian Jürgens, I learn that there is no magic to serving a perfect main course. The sauce is easy to reproduce. 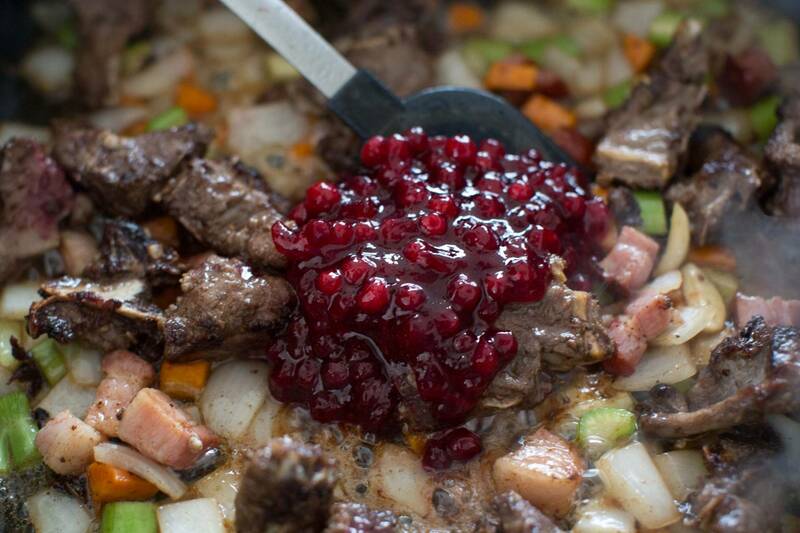 The saddle of venison in the marinade also seems more than doable. 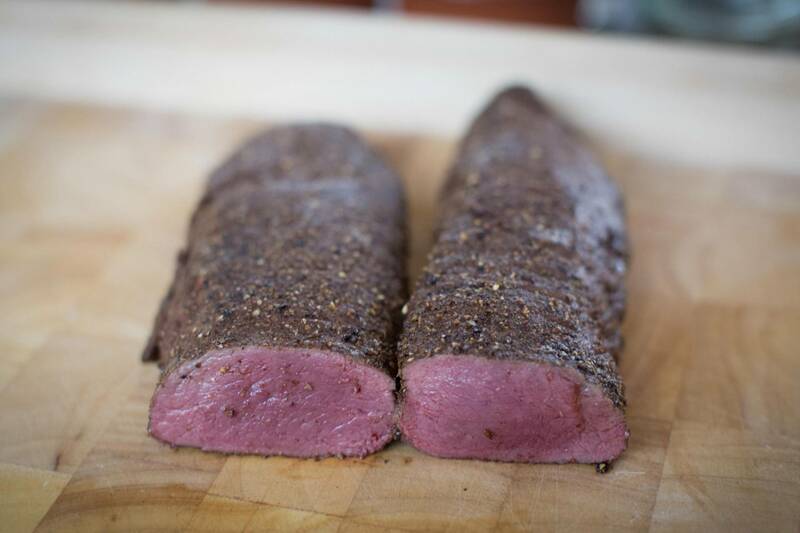 The biggest challenge is keeping the saddle of venison at the perfect cooking temperature (venison quickly gets cold and quickly tightens up. Of course, the quality of the materials has to be right. Even the best chef will only get an average dish out of low-quality meat. The venison from the Überfahrt, of course, is of perfect quality. Another thing that impresses me is that Christian Jürgens keeps his workstation clean with a professionalism that looks effortless, but has, of course, been precisely rehearsed over the years. Christian Jürgens’ saddle of venison is so tender when it comes out of the oven than I hardly need a knife to separate the meat on the plate. I lose myself in the pleasure of it. Unfortunately, I still have to finish the pineapple, which Jürgens flambées finely with a Bunsen burner. He makes it look very easy, like almost everything he does. When it is my turn, my hand is shaking. “You are doing that well,” says Jürgens and smiles at me. I am proud, although I don’t really believe him. My conclusion: the perfect main course! 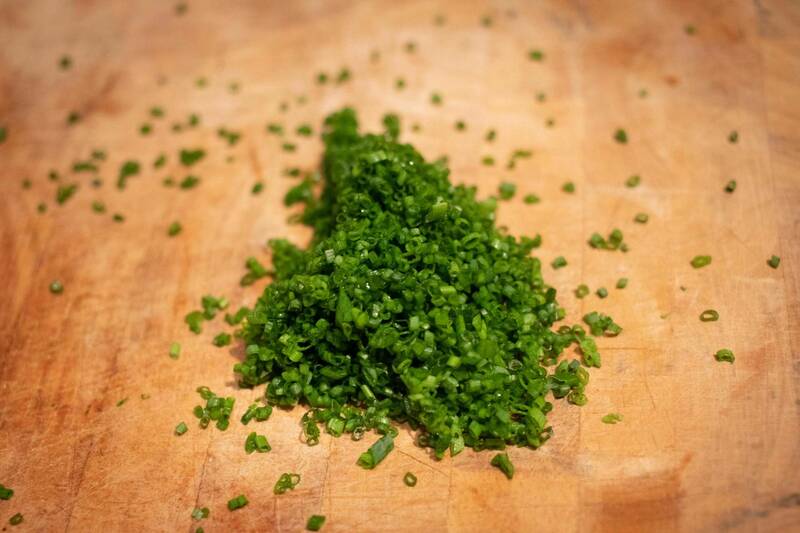 The mixture of seasonings can be prepared in advance, as can the sauce. And if you flambée the pineapples in front of the guests, that is sure to make an impression. It is said that there are unfortunately only a limited number of top class pastry chefs in Germany. Not many chefs have the necessary dexterity and are willing to forgo traditional career advancement opportunities in a Michelin-starred kitchen. There are supposed to be head chefs who have been desperately searching for good pastry chefs for years. The “Alois” restaurant on the first floor of the long-established Dallmayr store does not have this problem. Here, a man who is well-known beyond the city for his desserts works alongside the young head chef Christoph Kunz: Eugen Stichling. I discuss the end to my perfect dinner with him. Stichling shows me how to bake a little cheesecake in just a few steps (before the arrival of the guests) and how to make lemon juice, lemon grass, sugar and ginger into a syrup that will leave a beguiling aroma even hours later. When I catch sight of the coconut crumb, I can hardly hold myself back and have to quickly put a couple of crumbs into my mouth; I enjoy the subtle sweetness and the crunchy chewing experience. Eugen Stichling loves being a pastry chef. 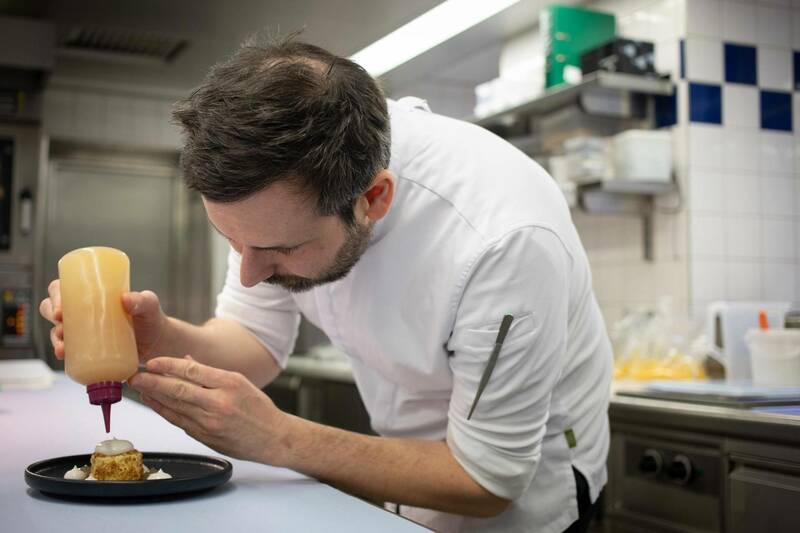 He has worked in this role at Dallmayr for ten years; last year, the restaurant was renovated and Christoph Kunz was employed as the new head chef. At the same time, the concept of the restaurant was changed. 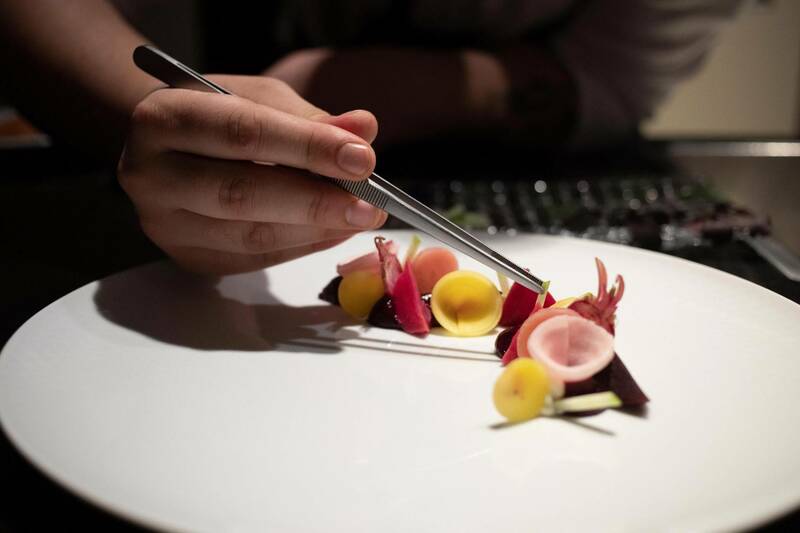 “We are focussing on young and light cuisine,” says Kunz. Without betraying the classical tradition of the store. Every evening, there is a “young gourmets” menu at very reasonable terms – for guests under 30. 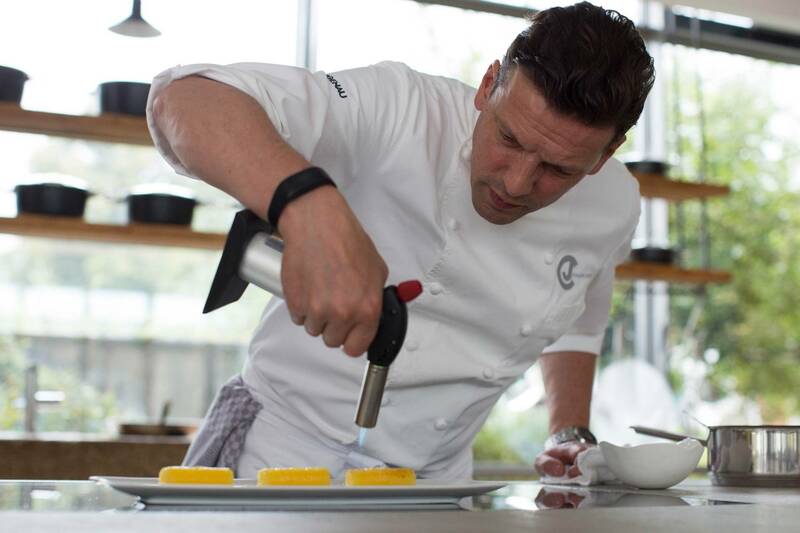 “Peoples habits have changed when it comes to dessert,” says Stichling. “Nowadays, we can take a risk and try something saltier.” The days are gone when the classic choice of desserts consisted of crème brûlée and chocolate mousse on a fruit sauce, even in upmarket restaurants. In any case, the little cheesecake seems to be a successful end to my perfect menu. I can hardly wait to see what my guests will say about it. When I invite my friends to my house three weeks later, I attempt Christian Jürgens saddle of venison first. The dish takes half an hour to prepare in the kitchen. I am relaxed, and my guests are honestly enthusiastic – especially when they find out that this is a 3-star recipe. I will keep the starter and the dessert for the next invitation. After all, the best guests are always those who have a reason to come back.